Ah, dancing! 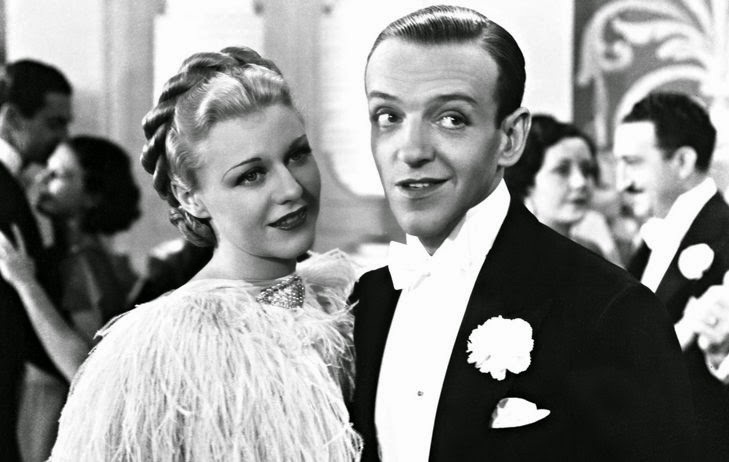 Who hasn't contemplated the image of themselves and their partner spinning madly across the dance floor, leaving Fred Astaire and Ginger Rogers wondering where those two got such awesome moves? I certainly have, and the images in my head were even in technicolor! "Gosh, Fred! Do you think we'll ever look as good as Tanya and Rusty?" For our fourth anniversary, I purchased beginner ballroom dancing lessons for Tanya and myself. It was a package deal containing four group lessons and one private lesson, beginning in January and ending this past Monday. Overall, it was a great experience and I think we would do it again, with a caveat. Group lessons were very effective and enjoyable. We had an informative, entertaining, friendly, and encouraging instructor that quickly introduced us to basic steps for several dances, including the Foxtrot, Texas Two-Step, Rumba, and Jitterbug. Each week dove a little deeper into more advanced moves in each dance. In case you were wondering, our favorite was Rumba. Group lessons were approximately 40 minutes long. This is actually a very good length for people that haven't ever danced before, as it gives the instructor time to get into two or three moves via demonstration while providing time to the couples to practice. Two or three is not an overwhelming number and gives you a small set of things to practice at home. The group was a manageable size (5 couples). This is also really important, as the instructor has to be able to communicate with everyone audibly as well as visually. It's a dance studio, so there is always music playing that needs to be spoken over. Ten people is a small enough group that this wasn't a challenge. It also meant that we all occupied a small enough dance floor space that the instructor could easily pay attention to all of us as we practiced. We actually practiced at home (a little). This is essential to progressing given the way our instructor went from basic to more advanced stuff every week. You actually don't need that much room to practice, as most of the basic steps are boxy. Practicing dancing with someone you love is a pleasant way to spend a few minutes in the evening. We weren't the only students in the studio. I mentioned above that there was music the instructor had to speak over. There were also other instructions going on on the dance floor, so that had to be contended with as well. We were constrained to a spot on the floor which seemed adequate, but it would have been interesting to see how the instruction might've been different if we'd had full use of the studio. We missed one group lesson due to work. Given that we weren't practicing at home in a really dedicated manner, missing one of the lessons had a tangible effect on our progress. If you only have four group lessons to begin with and you miss one... you do the math. The private lesson was a sales pitch instead of a real lesson. The last point is where the caveat comes from. We suspected that the last lesson would be heavy on salesmanship, but didn't think it would be the focus at the cost of ineffective instruction. As opposed to our great experiences in group lessons, the private lesson was a completely turn-off. The instructor was not the same as the one from the group lessons. This one was fake-friendly (the way sales people are), didn't spend any time determining how much we knew/didn't know about dancing already, and didn't seem aware of the fact that we had just completed the group classes at all. The result was that we spent 20 minutes doing basic steps from dances we either didn't care about or already knew from group lessons. The exception was the Tango, which I'm certain would have been our favorite if we didn't already have a sour taste in our mouth from the first 15 minutes of review. You might have noticed that I didn't include the either the studio's name or instuctors' names. I did this purposefully, as the studio is part of a franchise and other people's mileage may vary. If you're really interested in the details, drop me a line and I'll gladly supply them. With all this said, we are still really interested in ballroom dancing and will probably look around at other studios for other beginners packages. We might even invite some friends to join with us. If you haven't ever given it a try, you should definitely consider it. Ballroom dancing is athletic artistry, after all, and a worthy pursuit of self-expression.